Our Family English Adult Learners complete their course! At St Andrew’s we have lots of opportunities for parents/carers and friends to participate in our Adult Learning Classes. We have just completed a Family English course; for adults where English is an additional language and we are very pleased to show you all our attendees with their completion certificates. The group have gained some essential skills in communication and we feel have gained confidence in using these skills!! 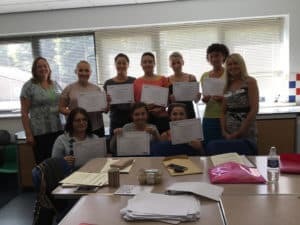 A big well done to everyone who has come along and we look forward to seeing more parents joining other Adult Learning classes that we will be running in the new term in September. Keep an eye out for more information when we return after the Summer Holidays! !